28-Nov-2014 -- Driving south from Perth to Margaret River, I made a short detour to visit this confluence point. I left the freeway and drove through the towns of Pinjarra and Waroona, then turned left onto Logue Brook Dam Road towards Lake Brockman. I turned onto Scarp Road, which started off paved, but turned into dirt (though easily drivable in my 2WD rental car). I parked at 33.00067°S 115.99294°E - 600 m from the confluence point, where a dirt path (blocked by logs to prevent vehicle traffic) led eastward towards the confluence point. 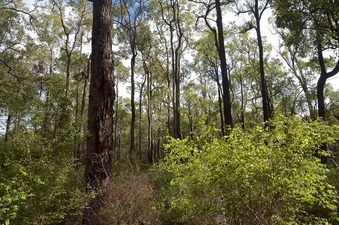 Hiking along the dirt path, I noticed that many of the gum trees in this area had blacked trunks from recent bushfires. The dirt path passed just 35 m south of the confluence point, which was easily accessible by hiking through green vegetation (lush from recent rainfall). The confluence point lies in a small clearing, among gum trees. Driving back along Scarp Road, I saw several colourful parrots (mostly green, with patches yellow, blue, and red on their neck and head) cavorting beside the road. I later learned that they were Twenty-eight parrots - a subspecies of the Australian Ringneck.